For the first (real) post of 2009, I present to you a project I did a few years ago with my kinfolks down here in GA. 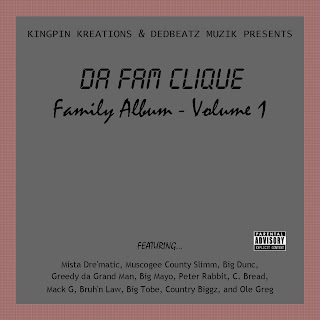 This is a compilation of sorts with a wide range of themes and styles but the common thread is that yours truly is the sole producer (with the exception of one track) and all the MC's are real family (or close enough that we consider each other kin). When we first started recording, there were no intentions of making an album. It was just some real folks, hangin' out, blowin' purp, drankin' brews and kickin' the phukkin' bobo. 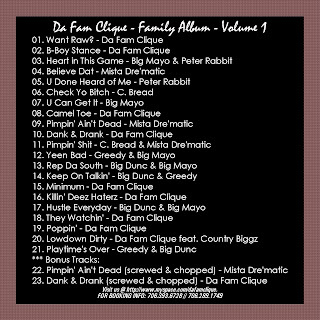 It ended up being a local classic, even spawning a couple of tracks that got some radio play for a lil while. Hope you enjoy this as much as we did recording it.